This site’s main subject is molten salt reactors, and strictly speaking, there should be no reason to start talking about radiation here. Any future reactor plant will have to live up to strict regulatory standards and those will demand that adequate measures be taken in relation to ionizing radiation. However, fear of radiation is a more general problem. And is a major issue in the public acceptance of nuclear energy. People are easily frightened by what they don’t understand. Especially if they don’t see it, while they’re told it is there. Well, the radiation is there, so much is true. On average, you’ll get a yearly dose of radiation of about 4mSv. By far the most of this is from natural resources: radiation is a natural phenomenon. That’s nothing to worry about: our cells can deal with it, as they have done for hundreds of millions of years, our distant ancestors arose in a world that was even far more radioactive than the world of today. This charming xkcd chart helps you put radiation dose levels in perspective. It gets even better: many researchers in the field of radiobiology will tell you that ionizing radiation, the kind of radiation you get from radioactive sources, is far less dangerous than cautious scientists dared to assume in 1960, the time that our present regulations were designed. In those days, the so called linear no threshold (LNT) rule was formulated. It’s a rule that states that, as long as we do not know the effects of low dose radiation, we simply assume that there is a linear relation between the radiation dose and the chance that somebody gets cancer. This linear relation refers to the number of cancers that occur when people are exposed to high doses of radiation: nobody disputes the fact that high doses of radiation can cause disease or even death. The chart shows we get low doses of radiation every day, mainly from natural sources. A common sense approach here could be that since our ancestors have been exposed to low dose levels of radiation since life itself arose, we could simply assume we can deal with it. No, says LNT, we assumed there is a linear connection, so radiation at natural background levels must cause cancer as well. LNT works like this (quote from NYT article of which you’ll find the link below): “A full sievert of radiation is believed to eventually cause fatal cancers in about 5 percent of the people exposed. Under the linear no-threshold model, a millisievert would impose one-one thousandth of the risk: 0.005 percent, or five deadly cancers in a population of 100,000.” If we calculate a little further on that number, natural background radiation for a an average place on earth (4mSv yearly dose) would cause 20 deadly cancers in the same population: a number impossible to detect among he larger number of yearly cancer fatalities. LNT has no empirical basis whatsoever. But it’s also almost impossible to disprove. That does not prevent some people from making frightening calculations that are based on LNT. If you’ve come across large numbers of deaths caused by Chernobyl of Fukushima, these numbers have been calculated, based on LNT. Those deaths have not been, nor will ever be observed in causal relation to those accidents. In this article that recently also appeared in the book ‘This Idea Must Die: Scientific Theories That Are Blocking Progress, Stuart Brand writes about LNT. He quotes one of the men that were present at the time that LNT was formulated, George Kistiakowsky. Virtually all of the strict regulations that surround present day nuclear activities of any kind, are based on LNT. Safety instructions for radiation workers, required for anyone that needs to work with radioactive materials, are based on LNT. Disposing of low level nuclear waste, expensive because special precautions need to be taken, are based on LNT. Hundreds of billions of dollars have been spend and earned, all based on LNT. A rule-of-thumb is as totally arbitrary now as it was in the 1960s. But once formulated and accepted as a rule-of-thumb, LNT appeared difficult to dismiss. With LNT, we have entered an interesting field of which the borders inevitably hit a demarcation line between science and belief. The catch 22 for scientists here used to be that it is very difficult to be sure of the effects of radiation at dosage levels equal to or lower than the natural background radiation. Radiobiologists need to do some of their experiments in deep underground sites in order to get rid of the radiation that happily beams through us from natural sources, every single day. In the article referred to above Stuart Brand says that “In the US we are all exposed to 6.2 millisieverts a year on average, but if varies regionally. New England has lower background radiation, Colorado is much higher, yet cancer rates in New England are higher than in Colorado—an inverse effect. Some places in the world such as Ramsar, Iran, have a tenfold higher background radiation, but no higher cancer rates have been discovered there. These results suggest that there is indeed a Threshold below which radiation is not harmful. Unlike what many people believe, radioactivity, and its ionizing radiation, are as natural as the daylight itself. From the beginnings of life, we have been enjoying a bath of radiation in which life has evolved and thrived. Just like it is with the radiation that we call light, there are many aspects about radiation that are not really ‘intuitive’ – the numbers can be a bit confusing. One example: a piece of of white paper in sunlight is ‘much brighter’ in sunlight than it is in a moonless night (in which it is still only just visible). How much brighter? In sunlight, the paper is 1.000.000.000 times brighter than in a moonless night. If you’re concerned about radiation, and you read in the paper a worried report about somebody ‘having received 40 times the usual amount of radiation’, just check the usual numbers. This wonderful radiation dose level chart by xkcd is probably one of the best references for all sorts of radiation dose levels. It’s definitely the most amusing radiation dose chart you’re gonna find on the internet – and it’s quite accurate, despite its disclaimer. At what dose levels does ionizing radiation become harmfull? Bluntly put, quoting David LeBlanc ‘at dose levels below roughly ten percent of what kills you, there’s hardly any effect to be found’. This means the present, very strict, levels of acceptable radiation exposure can be safely raised. In his amazing book ‘Radiation and reason’ retired Oxford radiobiologist Wade Allison convincingly argues that the levels can be raised by a factor of thousand. He stresses the point that he left a large margin. More recent research confirms his position. In a presentation in january 2013 Ron Mitchel of Chalk River labs argues the levels can be raised by a factor of 26.000. Once accepted, the consequences of these insights are difficult to oversee. One implication is that safety procedures and rules, based on present regulations, cause nuclear energy to be far more expensive than it needs to be. A second implication is that thousands of people in Japan left their homes close to Fukushima without any real need to do so. Extensive argument to support this claim will be given later on. 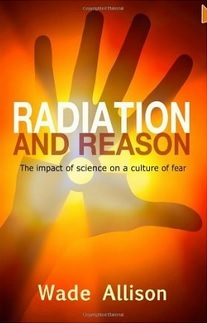 In the meantime, a good start is to read Wade Allison’s Radiation and Reason (2009). The cover design makes one wonder whether the designer had a Pavlov reaction hearing the word ‘radiation’: it certainly reminds one of the fear-ridden cliché’s of the 1970s.) The actual message of the book is a long way from those cliche’s, namely that ionizing radiation is at least 1000 times less harmfull than previously supposed. Wade Allison underlines that he has no financial involvement in any part of the nuclear related industry. He simply wants to inform people with what he calls a very positive message. Hormesis – could low dose radiation actually be good for you? Charles L. Sanders. In it, the author explains how low-dose radiation can in fact decrease all-cause and all-cancer mortality and help to control metastatic cancer. A growing number of scientists believe that low dose radiation is benificial for your health. This so called hormetic effect, or hormesis, is not unique to radiation. The effect has been studied for many toxins, and the common pattern is that at certain low dose levels of the toxin – or other condition like low temperatures – the exposure to it stimulates the immune system of the body, resulting in better resistance and health. According to this article in Discover Magazine, that gives a nice overview of research an resources on the subject, the scientists that think radiation is one of the many things in nature producing hormesis are still a minority, but as it is with science, the majority is not necessarily right (or wrong, for that matter…). It is important to notice that Allison and Sanders are not alone in their claims. SARI, Scientists for Accurate Radiation Information, are bringing together evidence in this field and also share their knowledge with a broader audience. Their consistent message: our fear for low dose radiation has no scientific basis. This irrational, but systematically fed fear, has caused, among many other things, that nuclear energy is presently much more expensive than it needs to be.